​Raffle: Don Bennett brought pickles, wine and chocolate. ​Next week is 9/11, the observance to remember those involved in 9/11. In remembrance, next week if you would like to wear red/white/blue or your most patriotic outfit, please do! Happy birthday to those members with September birthdays: Connard Hogan, Tom Heath, E Russell Smith, Jody Dolan Holehouse, Diana Cecala, Sandy Grasso-Boyd, Chris Baxter. 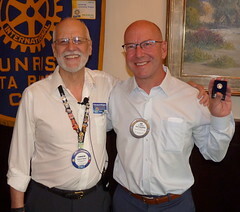 Happy Anniversary to those members observing Rotary anniversaries this month: Bruce Belfiore, Dennis Johns (wherever he is), Karen Kawaguchi, Liz Werhane, Maurice Moreno, Colin Stephens. Reminder: The invocation is for a message of inspiration or thought. Let’s save the jokes for Pay N Tell. Brooke Sawyer is giving up his driver’s license, and he could use rides to the meetings on Wednesdays. Contact him if you can help. 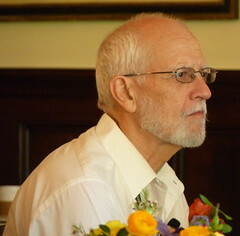 District Governor Jack McClenahan will be at Sunrise on 9/18 and will be our guest speaker. There will be a reception on Tuesday, 9/17, from 5-7 PM at Betsy Munroe‘s house for those of you who would like to meet Jack outside the regular meeting. If you would like to attend this reception, Betsy needs a head count no later than Thursday, 9/12. You can email, call, or see her after the meeting. Joanne Orenstein announced the seeps tour was cancelled due to “unforeseen operational issues.” Venoco will call us for the first tour in the spring. Sandra O’Meara and Andy Doerr presented a check to the RCSBS Charitable Foundation, representing the 2012-13 raffle money of $3,832.05. I have no idea where the $.05 came from. Scott Burns introduced Claire Cooley. She is going to Naples, Italy, for a yearlong exchange. She will be practicing her Italian. Bruce Belfiore wished her well — in Italian. Sandy Grasso-Boyd introduced Owen Tassicker from Australia to talk about the early June 2014 RI International Convention. His club, Baldwin, has about 65 members. He’s visiting about a dozen clubs between San Diego and San Francisco to invite the club members to the convention. He’d like to see at least half this club in Sydney next year. They want to lend a hand to people who want to plan a good pre- or post-convention tour. Darren Doi is back with a ring on his finger. The wedding was a success. Dana Goba is now engaged to Eirik Holm. Andy Doerr announced that the Fiddlers’ Convention is in about one month! Each member will receive an envelope with 10 tickets to sell or purchase. These pre-sales are quite important to the success of the event. Volunteers are needed Saturday, Sunday and Monday. There is a committee meeting on Thursday at 5:30 PM at MTD. Ken Beisser is looking for a volunteer to help with the vendors. The Wednesday after the Fiddlers’ Convention the club will be dark. Getting To Know You with Steve Kally. How did you get into your current career? His parents owned restaurants, which he started working in once he was 12. By age 17, he was buying stock. He was trading options pretty much daily in college. After college, his broker suggested he get into the business. He did. The first stock he bought was the phone company of Mexico, and he still holds some of it. Before that, he thought he was on track for working in hospital administration. 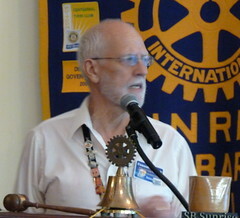 Bill Abel read the Rotary Minute about the Rotary Foundation. More than $3 billion have been donated to the Rotary Foundation. Raffle Results: E. Russell Smith and Betsy Munroe won. Pay & Tell with Sergeant at Arms Andrew Chung. Program: Betsy introduced Ed Fleming to speak about woodworking and David Vo to speak about flashlights. This is the first in a series of vocational programs. David’s interest in flashlights began when he was shopping for a flashlight. He tends to research his purchases, and while researching flashlights, he discovered that the big names in the industry are far behind what smaller shops and hobbyists are producing. He shared a flashlight comparison. He modified a standard Maglite to go from 76 lumens to between 900 and 1300 lumens. You can change the lights, add adapters, change the lens, change the reflectors, etc. Certain lights can get hot, so you need a body that can manage the heat. You can measure lights in candle power or lumens. Pitting the reflector gives you a cleaner beam. There are 8,000 18630 lithium 3.7V batteries in a Tesla. Don’t count. Trust him. Some flashlights even have memories. He probably owns about 20. Google candle power forums to learn more. Ed got into wood shop in junior high. He brought great photos and objects to share. He has a full wood shop. His oldest son wanted to be a carpenter. They worked together on wood projects for two weeks, and then the son decided he’d rather go to college. Ed bought 200 wheels to make small cars. He finally ran out of wheels. And then he started making wheels. He could buy a hinge for $1, which is too expensive when he could make one in about 6 hours. He hasn’t cut himself in the past six months — nor has he worked in the shop in the past 6 months. A little model T car can take 120 hours+. He does a little metal work, too. He was a machinist for about 11 years. Joanne’s grandson loves the little wood car Ed made. As a token of our appreciation, it is the Club’s practice to donate 15 dictionaries to local 3rd graders in honor of our speaker.